Gently pull the crown away from base of the watch and turn the crown clockwise until reaching the exact time, and then press down the button. if you feel the winding is tight, please immediately stop spinning, so as not to damage the movement. - Please keep the watch away from magnet to avoid making the watch stop working. - Tightening a walk for 24 hours, Please wind up the watch before every usage. - Daily water resistance(not for showering and swimming). 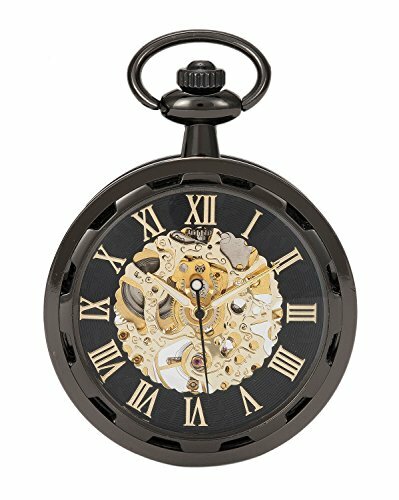 Fashion open face pocket watch, skeleton design, ideal for everyday living and fashionable nostalgic activities. Mechanical hand-wind movement?Magnetic field / temperature and impact will affect the accuracy of the watch, Daily manual winding and adjustment can reduce the deviation?, and no need to use battery. Easy setting,Rotate left,twisting the top button on the spin, tightening a walk for 24 hours (not too tight, avoid damaging the movement,Under normal circumstances 15-18 hands). Perfect addition to a formal or casual dressing or collecting or send as a gift. If you have any questions about this product by SwitchMe, contact us by completing and submitting the form below. If you are looking for a specif part number, please include it with your message.